When Apple and Google created a standard for the app developer and, at the same time, developed a vibrant market, HTML was on the defense. In 2012 and 2013, HTML5 was the solution, but now, the people who put their vote on HTML5 have become quiet. The truth is, apps are more powerful in creating fundamental value, especially for media companies. Apps have a better stickiness, the inventory is sold for a higher yield, and the brands are presented more and more uniquely. From a technical point of view, VisionMobile summarises the limitation of HTML5 development. The majority of you will say: We already have an app – an app for iOS, Android and Windows phone, maybe for Blackberry too. 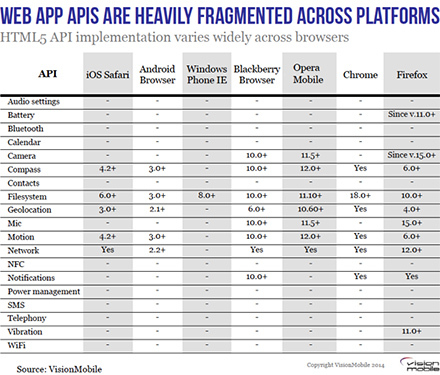 The problem: Most of these apps are copies of the mobile – and sometimes of the fixed-line – Web site. The usage and motives to use apps is totally different in respect to Web sites, whether they’re mobile or fixed-line. Some big brands like Yahoo and The New York Times tried products with a different way of presenting and combining news in an app. This is really a good move, but not consequential. In print, newspapers are offering multiple channels. Mostly, the reader only reads two of them, or a maximum of three of the five or six available sections. On the mobile Web site: Enable all available content, organised, and presented for the mobile situation. Using apps: For each channel – sports, economics, politics, art and culture, digital – create one app. The fundamental difference? On Web sites and using a browser, we surf. On apps, we consume! Take the chance to reach the right target group with the right app.